As I am getting ready, the telephone rings. It’s my friend Richard. He too is from Ottawa. 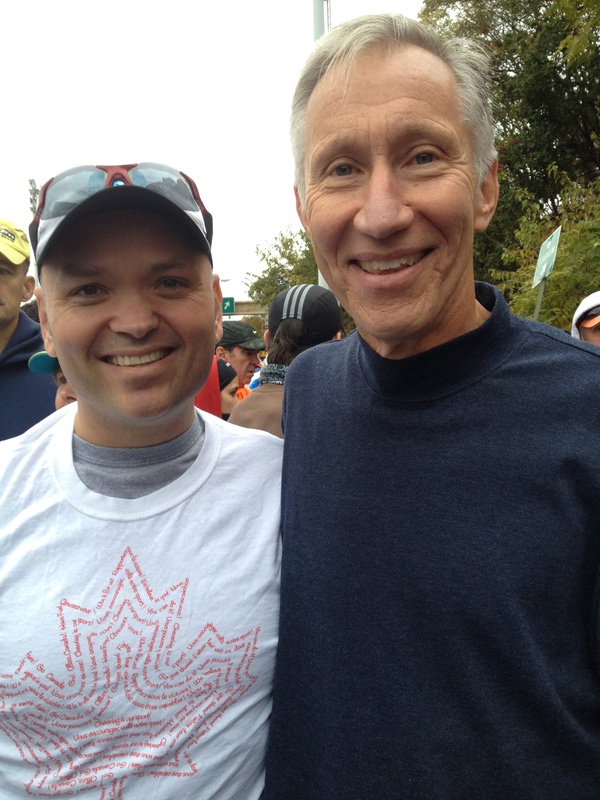 An incredibly nice guy in his very early sixties who runs unbelievably fast. I keep telling him that when I grow up, I want to be fast like him. I put on my running clothes and put on an extra cotton long sleeve shirt and t-shirt to keep warm at the athlete’s village. I grab my things that I put in the clear plastic bag that was given to me at the race expo as no other bags will be accepted at the waiting area. I kiss Gen who is asleep and head out the door. Richard is waiting for me in the lobby. The sky is cloud covered and it’s chilly. Not at all type of weather we had the last few days temperature-wise. We approach the Verrazano Narrows Bridge. We slow down to a crawl. Eventually we are let off the bus. Again, security is high and everyone is checked. Once inside the athletes’ village we wish each other luck and go our separate ways. Richard is in the first wave orange section and I am in the second wave blue section. Richard Borsos and myself at the athletes’ village. Eventually, it’s time to line up at the exit for my corral. There’s a woman with running shoes around her neck. She asks me if this is the line for corral #21. I confirm. I look down at her feet and she’s wearing running shoes. Hmmmm why the extra pair? Then I notice they are men’s running shoes. Curious, I ask her about it. She tells me her story. Five weeks prior, her good friend, a super fast triathlete, collapsed. It was just after two taxing ultra running events. Doctors believe that he did not give his body enough time to recover. He is now paralyzed on one side and can barely walk. He hasn’t given up and looks forward to competing again. Doctors aren’t so sure. 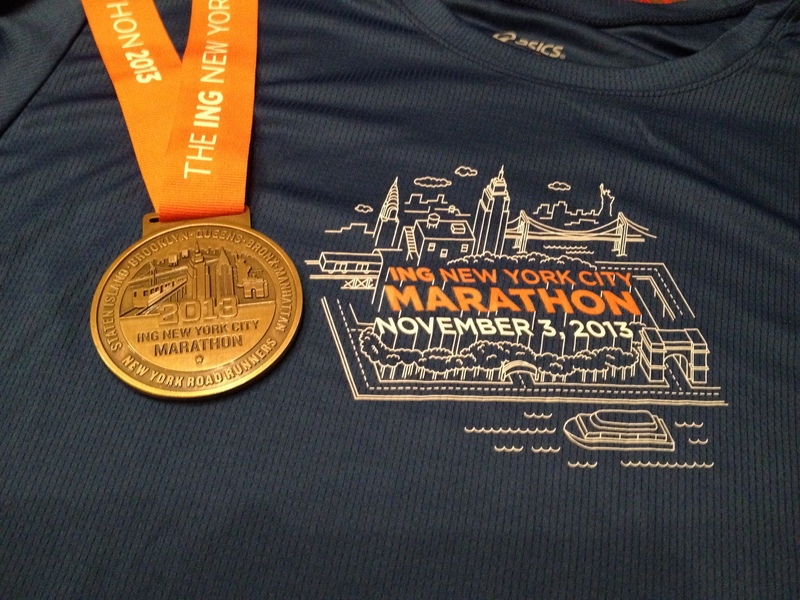 He was registered to run the NYC marathon but obviously couldn’t. His friend decided that she would run it for him and she would bring his shoes across the finish line. I tell her that she was doing something good, something inspirational. She smiles and thanks me. She asks me to sign the back of her race shirt. I oblige. I have something in mind but then write something completely different. I write “Run and Enjoy – Terry from Canada”. Huh? That’s the best I could do? I suppose what I meant was, run and don’t worry too much. Things have a way of working out. He sounds like a determined person and I wouldn’t be surprised at all if he competes again no matter the doctors may say. I hope she understands my message. I wish her luck. One last stop at the toilet and I get back on the road. It’s not long before I start up a conversation with someone else. This time with two runners; I meet Lauren from New York (currently living in Paris) and Dan from Saskatoon. We move slowly to the start line and stop. The national anthem is sung. A few announcements are made then the song New York, New York is heard blasting over the speakers. The crowd is excited and so am I! This is NYC!! We wait for the race to begin. The signal is given and we start running. 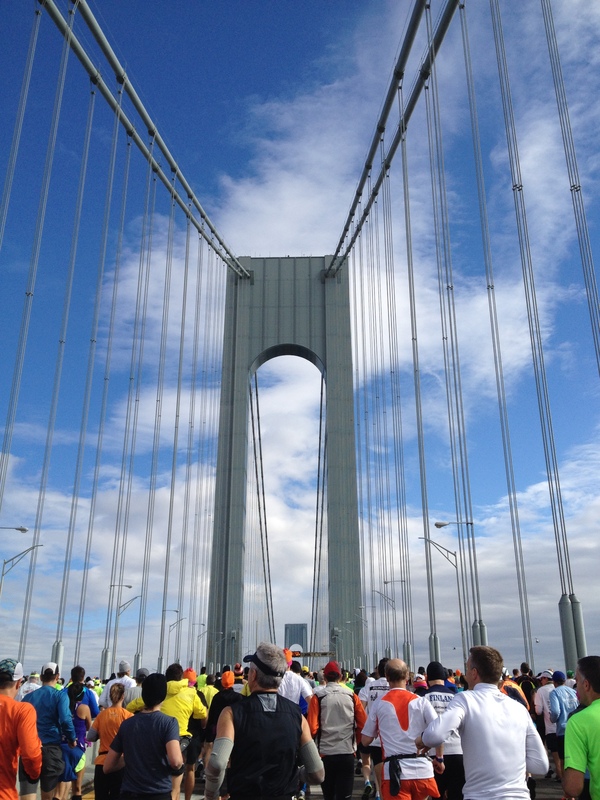 It’s crowded as we make our way up onto the Verrazano-Narrows Bridge. We lose Lauren. I take a few photos and videos – something I’ve never done during a race. I’m not sure they are going to turn out with all the movement but I go ahead anyway. There are helicopters buzzing everywhere. I feel like we’re being followed by crazy paparazzi! To my right, to my left and overhead – helicopters! I think Dan is the first to mention that he hopes nothing will happen like what happened in Boston. I nod in approval. 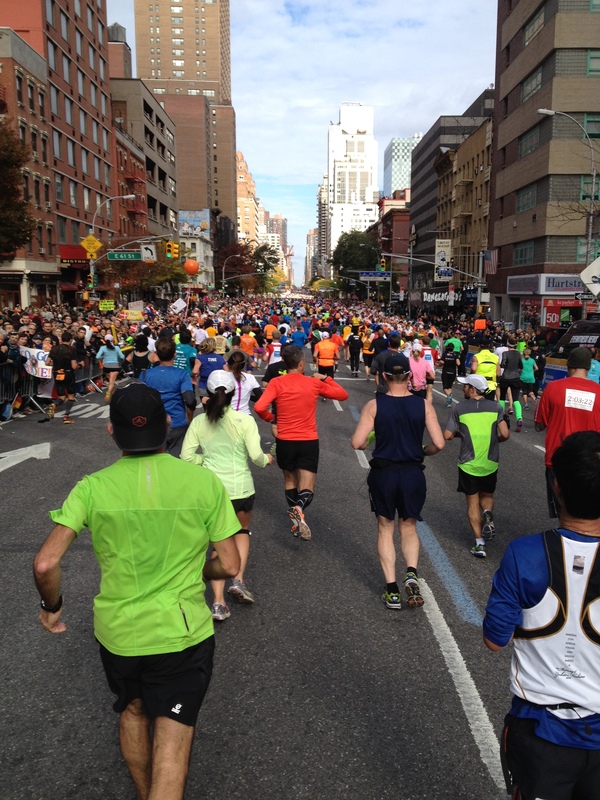 I put my phone away – I have a race to run! The bridge is over 2 kilometres long – it’s windy. I have a “pinch me” moment – how incredible it is to be running here. I had that same feeling seven months ago at the Paris Marathon in April. I am grateful to be able to do this. Not too far after the bridge I remove my long sleeve throw away shirt. The arm warmers stay on. We start running on land and at the first water station I head to the right and Dan to the left. I lose him in the crowd of runners. I keep running and looking around but can’t locate him as there are just too many runners. I’m on pace and feel great. The spectators are very supportive and there is band after band. I see more bands in the first 10 kilometres of this race than I’ve seen in entire marathons elsewhere. Upon seeing the large CANADA spelled across the top of my singlet, a guy on a megaphone says “Go Canada! Our friend and neighbour to the North!” Now that’s quite the welcome. 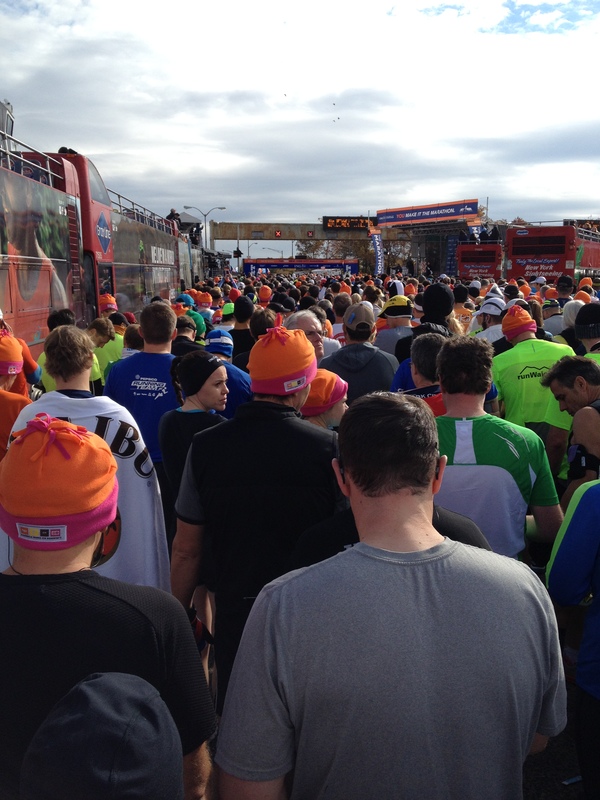 I’m constantly impressed by the crowds and the entertainment as I run through Brooklyn and then Queens. I feel great as we are about to climb the Queensboro bridge. We are nearing the 25 k mark. 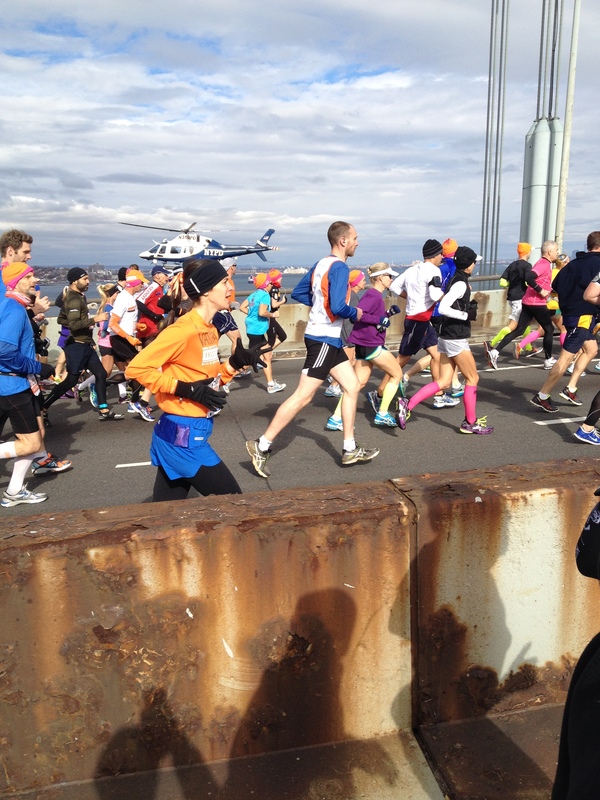 The crowds thin until we no longer see them – we are running on sections where there are no sidewalks. There’s a subway train going by above. It’s windy and cool again – I bring up my arm warmers to stay warm. After the constant cheering along the course so far, it’s somewhat peculiar to hear nothing but footsteps. I don’t mind it though, for me it’s one of the parts I will remember well. I glance over to my left and look over at the Manhattan skyline. This is definitely another “pinch me” moment as I quietly stare at the skyline. I see the UN Headquarters, The Citibank Building, the Sony Building and so many other well known Manhattan buildings. I’m not done running this race and I already want to run it again. I can hear the crowds cheering from a distance as we are almost across the East River. It sounds like a rock concert. I consider taking my phone out to take a video. Again another first, but this is too amazing not to capture. It’s incredible! The crowd response is beyond anything I’ve seen anywhere else. The race organisers proudly boast that they have 2 million spectators along the course and I believe them. I am starting to slow down. I don’t know what’s going on. I keep pushing. A few turns here and there and then I’m on 1st Avenue. This is where one gets a true sense of just how big this race is. The avenue stretches on for about 5 kilometres and is completely straight. There’s a gradual incline but it levels off in the distance giving you the impression that the road ends and that the runners in the distance are falling off. During this stretch, I receive the most “Go Canada!” cheers of the race. I also get several variations including “Go Eh! Go Canada Eh!”. I try and say “Thank You!” to all who cheer for me. I may not know them but they sure are helping me with their cheers! My pace keeps fluctuating but I roll with it. The body’s fine, I have no aches or pain; just fatigue. Near the 32 kilometre mark, I hear a familiar voice. It’s Dan from Saskatoon! He’s moving at a slightly faster pace than I and so I decide to stick with him. He tells me he’s suffering badly but he’s in good spirits. We are running in the Bronx now. Soon we’ll be heading down towards Central Park – we are both looking forward to it. We finally see the road leading in to Central Park near the Guggenheim museum. The course gets narrow and crowded in areas. Again, the spectators are ever present. Dan wants to stop and walk; I wish him luck and tell him I’ll see him at the finish line. I continue running giving it all I’ve got. Not far now. Less than 4 kilometres to go. I turn right on 59th street – almost there! I don’t know why, but at this point, I start thinking of my father (he passed away in 2001). I wonder what he might think of me doing this (I started running in 2007). My eyes well up when I think and know that he’d be proud. I also think of my grandmother, who passed away just one month before the race. I don’t know why I’m going through this. It’s not like me. I quickly snap out of it but I keep them in my thoughts. The Time Warner towers at Columbus circle are getting closer and closer. I dig deep. It’s time to use up all I have left. I turn to the right at Columbus Circle. I’m back in the park. The path is lined with flags from every country represented in the race. And just like that – I cross the finish line. Marathon 27 done! I take out my phone and take a photo of myself with the Finish line in the background. My finish time is not my best one but it doesn’t matter. The experience alone was amazing. I wait for Dan. I see him and head towards him. I shake his hand and congratulate him. We continue walking as he gives me a side hug. We receive our medals. We are happy. There really is no other feeling like it. After a long walk out of the park we eventually are given some fancy fleece lined orange ponchos. The air is cool and the ponchos are just perfect to keep us warm. We walk down the stairs to the metro station at the Dakota. The legs are stiff. Once downstairs, we are greeted by NYPD policemen who says “If you ran the race you get to ride for free” as he opens the metal gate to let us through. We thank him and get on the next train. As I prepare to get off the subway at Times Square 42nd Street, I shake hands with Dan one last time. What a wonderful weekend! What an incredible race! Within days I put my name in an early draw to win an entry in the 2014 race. I will remember this for a long time to come! On December 1st I officially entered the draw. Now I wait to find out if I will run the race in 2014.